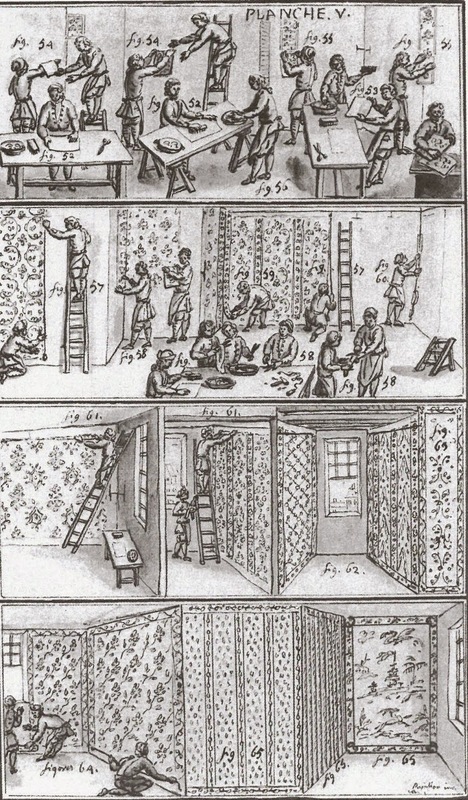 If information on wallpaper design in the first half of the 18th century is limited, evidence for manufacturing processes is even more scarce. The main source again is Jean-Marie Papillon. 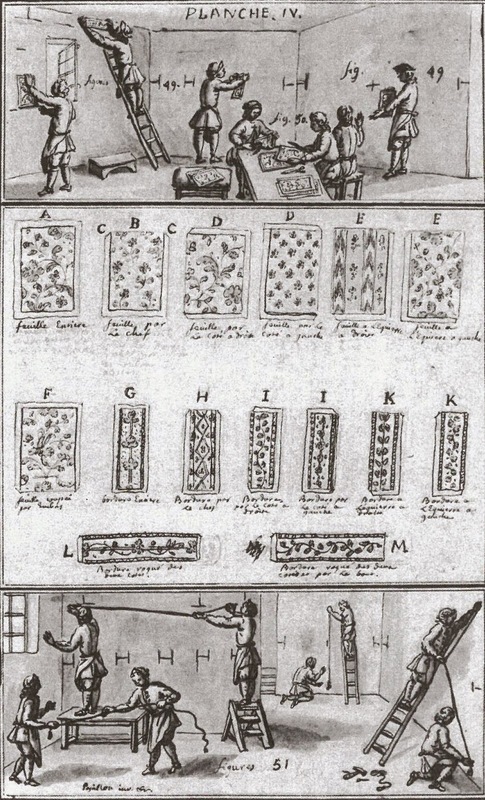 In the early 20th century Monsieur Violle, a government official in Diderot's home town of Langres, discovered seven sheets of black pencil and wash drawings, all signed by Papillon, and illustrating various aspects of the wallpaper trade. The presumption is that these were submissions for inclusion in the Encyclopédie which were never published but had been left behind by Diderot, probably when he went to visit his sister in Langres in July 1759. The plates were published for the first time by P.Gusman in 1925. 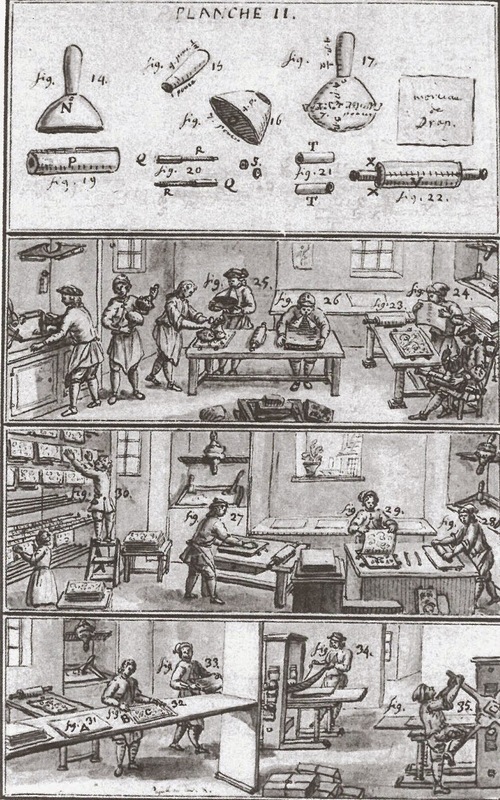 The pictures no doubt represent the interior of the workshop in the rue Saint-Jacques. 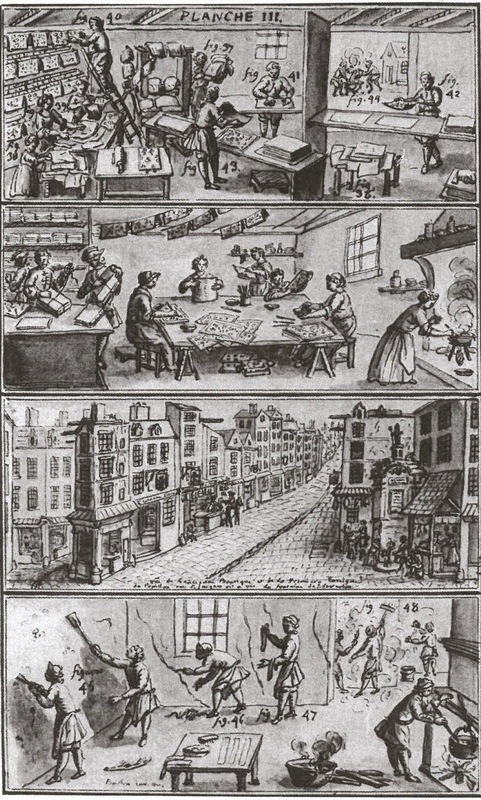 In his Traité Jean-Michel Papillon describes how he resented being forced to work all day in his father's business "printing wallpapers, as likely colouring them in when I was not cutting out the blocks, as going to houses of quality to attend to the hanging of papers" (Quoted Wallpaper p.27). 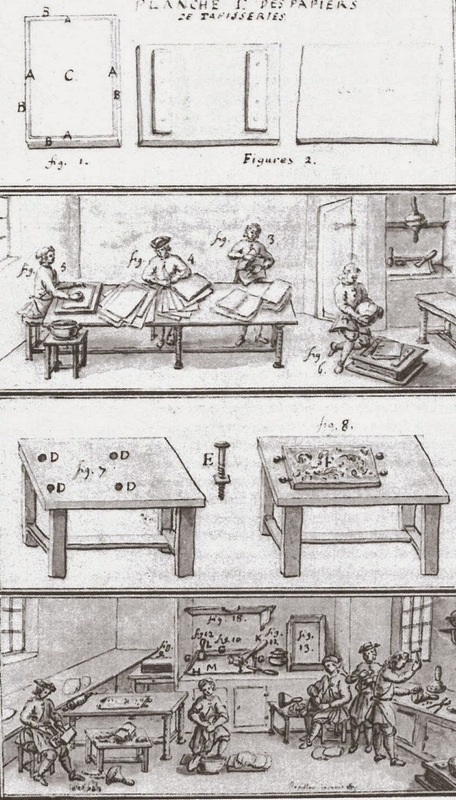 It is interesting that four of the seven drawings are concerned with paper hanging which was evidently the most delicate and difficult part of the profession, often involving complex arrangements of wooden panelling and stretched canvas. Papillon illustrates the various different types of papers - panels for fireplaces and chimneys, continuous designs for large wall panels, landscapes in the Chinese style, edging papers, friezes, papers imitating wood and marble, and floral designs and rosettes for ceilings. 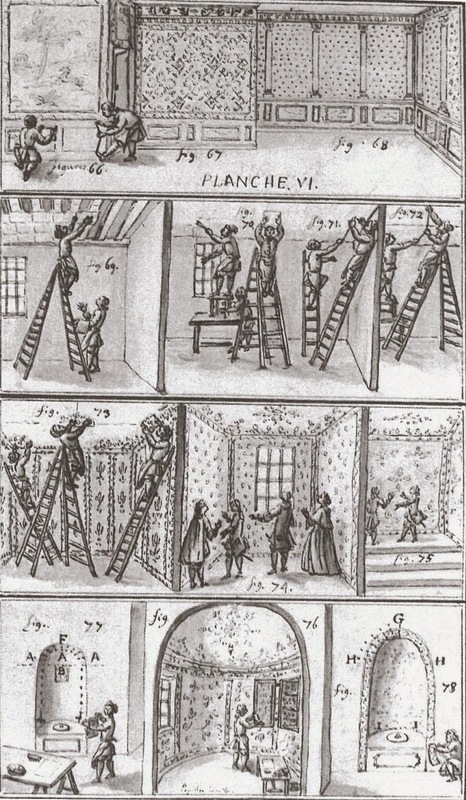 He also shows techniques for creating false paper ceiling, for papering a staircase and a circular alcove. He includes both flock and distemper papers. between two planks by means of heavy weights. Strip 1: Inking pad and rollers. Strip 2: A sheet of paper is prepared and carefully placed on the block. Strip 3: A sheet is printed, lifted off the block and hung to dry. Strip 4: The newly printed sheets are piled up. the old paper is removed and the glue heated. Strip 4: Bottom borders. Completed panel in the Chinese style.